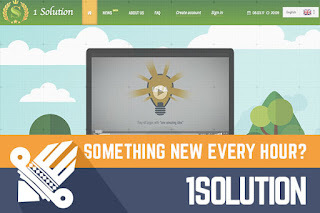 DavidNews HYIP blog - News & Reviews: 1Solution - Something new every hour? 1Solution - Something new every hour? Perhaps it does not seem from the first sight 1Solution is a unique project that was added to Standard listing 16 days ago with $200 reinvestment. Yes, it might not seem like that, but there is one interesting point that sets 1Solution apart from other projects out there. If you would like to find out about this point, read the continuation of this review. I'm quite sure many of you who would visit this project simply would skip it because of childish design or you would not be able to understand what exactly these graphs on the bottom of the main page mean. To be honest, I still can't get exactly what they mean, but when we take a deeper look turns out that this project is quite exciting. The great thing is that everything is available in 5 languages, but about the biggest thing, I will explain in the next paragraph. There is one fascinating thing about his project what makes it unique, but odd at the same time. There is no real investment plan, by that, I mean that it is not possible to describe investment plans simply because every hour there is new investment plan generated with completely different terms and conditions. It may sound silly, but actually, I find this brilliant because this is a great way how the administrator can control actual cash flow of this project. If there are days when people does not invest that much simply put low return investment plans if people invest put bigger and so on. Yes, I will not comment on the investment plan that I have or plan that I can invest at this given moment because it will make no sense for you because at the time when you will read these lines you will have another investment plan option for you. But there are few things that we know about this project that will not change anytime soon. Profit accruals are made only on working days, and each member can create no more than one deposit per day. The nice thing is that it is possible to invest with a variety of payment options, such as - Perfect Money, Payeer, AdvCash, and Bitcoin. Interesting is that you will be able to withdraw instantly and to any above-mentioned payment option what is rare these days because usually administrator allows withdrawing only to payment option that you initially used for the deposit. To summarize, I would like to say that for me it's always about first impressions. I trust my instincts, but this time when I took deeper look turned out that project is worth more than I thought. A lifetime of 1Solution already have proved that administrator knows what he is doing, but in any case, if you plan to invest than do that only with funds that you can afford to lose. Investment plans: Changing various investment plan offers each hour. Interest accrued only on business days. YoBit allows you to claim FREE COINS from over 100 unique crypto-currencies, you complete a captcha once and claim as many as coins you need from the available offers.